Expose your friends to the test! Purchase a certificate as a mysterious surprise for a friend! Our certificate is a beautifully designed personal invitation to take part in one experiment at Affect Laboratories. These certificates are the perfect gift for friends and family! Not only will the recipient enjoy their experiment, but you will probably chosen, as a co-participant or secret observer! Additional purchases include a telephone call from Affect Laboratories, as well as a special meeting with the courier who will personally deliver the certificate in character. To purchase a certificate, you need to fill out an online form. You can also purchase a certificate from our receptionists. 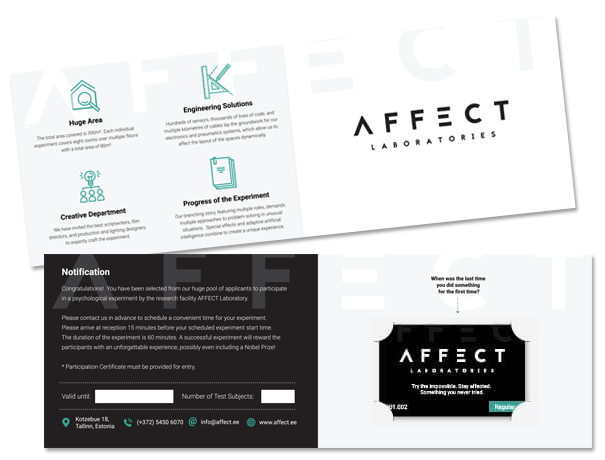 Certificates can be picked up at our facility, mailed, or especially hand delivered personally by a member of Affect Laboratories. Payment may be processed via bank card, bank transfer, or cash in person with our receptionists. Be sure to present your certificate when visiting your experiment. Certificates are valid for up to one year from the date of purchase. Standard/Premium certificates cover different time sessions. The examinee is under strong the influence of drugs or alcohol. The examinee is under 18 years of age and has no signed “Participation Agreement” from an adult legal representative. The examinee is a pregnant woman. Sign up now to participate in our exciting experiments! We are always happy to respond to any questions you might have. A confirmation email was sent to your email address. We expect you to arrive at least 15 minutes before the experiment starts.